If these amazing craft could actually reach the impressive speed of two miles per minute (120mph), how long would it take to reach the sun? Over fifty years, or so says the margin notes in the original. I have never seen such a wonderful portmanteau of craft-shapes compiled into a single speculative spacecraft: the body is like that of a steamship, front-weighted like an airplane, with airelons and control surfaces both fore (like the Wright flyer) and aft (like most airplanes) — and not only did the artist theorize a single spacefaring airship, he or she put together several designs of varying shape, including a space-faring zeppelin in the distance. It also appears that the “wing-like” surfaces were not functional, as you’d expect for a spacecraft: if you look closely, there are observation decks and tiny people at the edges. My use of the word “Steam-powered” is purely an assumption based on the time period; the features that look like smokestacks are supports for the wings; I cannot see any outward evidence of the ship’s power source. Based on calculations of time-periods, this was published around 1918 or 1919, so I assume the painting was done shortly before. (Want wallpaper of this image? here’s normal and widescreen.) From Our Wonder World. This entry was posted on Monday, March 23rd, 2009 at 11:27 am	and is filed under Uncategorized. You can follow any responses to this entry through the RSS 2.0 feed. You can leave a response, or trackback from your own site. 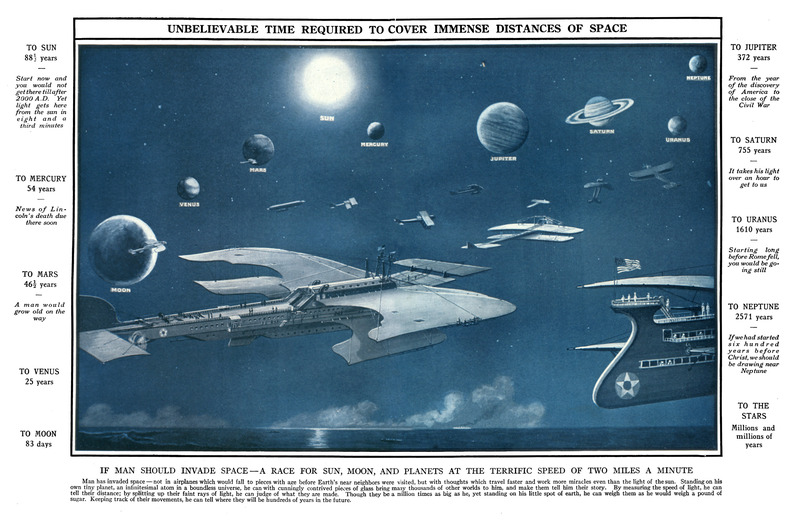 This artists vision of space travel was limited by how the physics understood in his time might be put to work, and so we chuckle at the naiveté of a hundred years ago. Einstein put a theoretical kabash on manned interstellar travel with his speed of light work. Maybe, and hopefully, a hundred years from now our descendants will have a chance to chuckle at our current naiveté, as they zoom from star to star based on some discovery we have yet to make. This is a gorgeous image. Looking at the bottom of the picture the sea is clearly visible, placing these craft within Earth’s atmosphere. 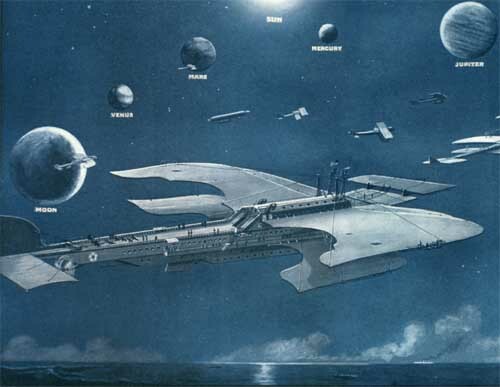 The nearest craft has a very ship like rear propellar and hull which makes me think that this is an image of imagined gigantic future seaplanes rather than spaceships. Transatlantic travel for astronimers of the future perhaps? Maybe the margin text referrring to space flight was added later out of context. Standing on the observation deck at 120mph would be a challenge but not impossible. Hah! I’m going to have to dig through my stuff. Somewhere I have an encyclopaedia-like set of books, inherited from my grandmother, which had this image in the “Science and Technology” volume. The original, perhaps? The same book explained in some detail that the Sun’s heat came from shrinkage — that it was so large that gravity pulled the layers down, and the released potential energy was the source of its power. As it turns out, before the discovery of nuclear reactions this was the prevailing best guess. « The Beautiful Land of Sound, 1900s.